Peter Parker: The Spectacular Spider-Man Annual #1 Review – AiPT! A fun and entertaining Spider-Man comic book that can be read by anyone. Following the events of The Amazing Spider-Man #800, J. Jonah Jameson is trying to fix his relationship with Peter Parker. It’s been a bumpy ride over the last few years, but now that he knows Parker is Spider-Man, he wants to prove that he can be a helpful friend and use his limited power responsibly. While Jameson forces things a bit, an old rival shows up in an attempt to scare Jameson, and maybe even kill him. For a series literally named “Peter Parker” it might be confusing to some to dedicate its annual to J. Jonah Jameson, but this is a fantastic character study that looks into what makes Jameson who he is. The story is told through a series of flashbacks as well as a single plot in the present. The flashbacks and present seem disconnected for a while, but once they finally link the story takes a great turn. 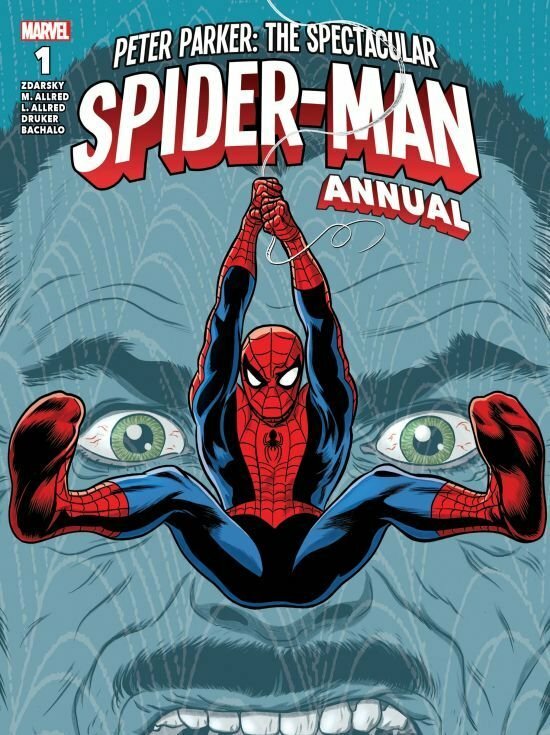 Annuals allow for one shot stories like this, and it allows writers like Zdarsky to tell slightly more mature stories that are not necessarily just Spider-Man punching things. The reader gets to learn a little more about Jameson, even after all these issues. The distancing of Spider-Man from the focus of the narrative makes him easier to relate to. Jameson is the protagonist while Parker becomes the character the story is told through. It is a welcome change for this single issue. It’s always a pleasure to see Michael Allred’s artwork, and if there was ever a character who went well with his style it’s Spider-Man. It’s unfortunate that there isn’t that much Spider-Man for him to play with, but his style does add to the fun silver age tone the book elicits. In regards to negatives, there aren’t many. Like mentioned, there is a lack of Spider-Man which, in a Spider-Man annual, can upset some people. On top of that, the way the story is paced, it takes a while for things to come together. For the first ten or so pages it does feel a bit like things just happening so a bit of patience is required. The backup story by Mike Drucker and Chris Bachalo is a pleasantly entertaining look at Peter. While a majority of the annual is devoted to Jameson, Drucker gives readers all the Parker angst they could want. A fun yet melancholic look into what it means to be Spider-Man in a city that desperately wants Moon Knight (a joke that lands two thirds of the time). It’s a short backup story but manages to say everything it has to in only a few pages. Bachalo’s Spider-Man is a work of beauty sure to divide fans between those who admire style and those who prefer consistency in their artwork. His muted colors work really well with the story in a subtle way. It has that nostalgic quality to it for readers who read Spider-Man in the early 2000s. Together the two stories offer a fun and entertaining Spider-Man comic book that can be read by anyone. New readers can easily enjoy this as their first Spider-Man comic and long time readers can add this to their collection. A solid Spider-Man comic, perfect for new readers and old. First Look: Kelly Thompson and Oscar Bazaldua Introduce MR. AND MRS. X!